I’ve been coveting one of the cute running skirts (basically a sporty A-line lycra mini skirt with built-in shorts underneath) from Runningskirts.com for the past few months, but the $48 price tag was a deal breaker for me. Well lo and behold, the twin founders of the company have put a nice selection of their running skirts on sale for $24 each in honor of their birthday. Check out the color combos and order soon; the sale is for a limited time only! If I hadn’t sworn off all new clothing purchases until next June, I’d have jumped on this already. I can turn down any number of regular clothes, but show me a piece of 50% off workout gear and my Paypal finger is ready to pull the trigger. As it stands, I will be sifting through my pattern collection to see which ones can be modified to make my own DIY running skirt this weekend. 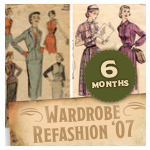 I ran across a group blog called Wardrobe Refashion today while searching for a site I recalled reading about in the latest ReadyMade magazine that features projects re-made from IKEA items. I never did find the IKEA-related site I wanted, but I was pretty thrilled to locate a multi-user blog devoted to refashioning, recycling, and reusing existing clothing and fabric stashes to make wearables. I’m going to see if I can make the cut off for the 6 month pledge starting August 1. This fits right in with my 1 year DIY Clothing Experiment anyway, and it would be nice to see what other folks are doing with the contents of their closets. For the morbidly curious, my nearly-complete inventory of patterns, fabric, notions, and refashion-ready clothes have been posted to a Google spreadsheet inventory. Your Spending Weakness: Latte Factor or Gazingus Pin? While I was reading Smart Couples Finish Rich and Smart Women Finish Rich by David Bach, I had a minor dilemma about a key portion of both books: Bach loves to kick off his books (all of them) with some anecdotes about the “Latte Factors” in the lives of his clients and seminar attendees, but I didn’t feel that the Latte Factor applied to my situation. Bach writes that EVERYONE can afford to save (aka pay themselves first) by simply giving up some of their unrecognized Latte Factors. This is true enough, but not really useful to me since my unnecessary purchases don’t fall into the Latte Factor pattern of regular spending. Let’s just say that with over 20% of my gross income already going into my combined Roth IRA and 401(k) retirement accounts, I have already eliminated nearly all of my Latte Factors and am not exactly a slacker in the savings skills department. So, while the Latte Factor might be a good starting point for the Level 0 savings newbie, those of us who are a bit more advanced and yet still aware of some remaining leaks in the financial boat need a different paradigm to describe our type of unnecessary spending. My Gazingus Pin when it comes to spending is the online too-good-to-pass-up deal. I’m a sucker for $10 after mail-in rebate + coupon code + Ebates.com kickback deals, discounted software upgrades, random $0.99 music downloads, Half.com books, garden catalog seed and plant sales, and clearance offers of just about any kind. I won’t buy unnecessary things at full price, but I WILL pick them up at 70% off MSRP, even if I don’t need them (yet). As a result, I have about 3 years’ worth of video and PC games I have yet to play, enough books to keep me engaged for at least ANOTHER 3 years, more seeds than I know what to do with in my dinky garden (I barely managed to squeeze in the 16 impulse buy daylily clumps I got last fall) and about two dozen other seedlings that need to go outside ASAP, a truly astounding collection of humorous t-shirts from Jinx.com and Threadless.com, and a stockpile of backup running shoes that should last me through 2008. I won’t even go into the Target clearance swimsuit collection. It doesn’t help that I am a regular reader of sites such as Slickdeals.net and Bensbargains.net. Browse through the posts of these sites on any given day, and you will come face to face with temptation. I’ve had to remove them from my Bloglines subscriptions and auto-delete any merchant sales and specials emails that land in my inbox to keep myself from buying stuff I don’t actually need (at the moment, though might in the future…). Do any of you have a Latte Factor or your own Gazingus Pins? What are they? This coupon is good through August 19. What a bummer that I can’t buy any clothes until next June! I’ve been thinking about food a lot recently. Okay, I think about food a lot all the time, not just recently, but this time it is with an eye to combining the foodie side of me that drools over the fish and chips episode of Good Eats on Food Network and the health nut side that winces at the words “deep fried.” I’ve already established that I am perfectly happy eating the same foods over and over again as long as I like them, so why, I thought, don’t I just sit down and make a menu for my slow post-wedding recovery cut that ONLY contains stuff I love and crave, carefully modified to work within my caloric intake and macronutrient guidelines? It’s just as easy to make a healthy stir fry with a tasty sauce as it is to grill up a plain old rubbery chicken breast with a side of broccoli and plain brown rice, right? STEP 1: Establish your nutrition parameters. For my desired rate of loss of 0.75-1 pound per week, I calculated that I would need to start at 1652-1755 calories per day using my handy Fat Loss Spreadsheet. I am attempting to follow the nutrition guidelines recommended for Turblence Training as well, so my macronutrient ratios will be approximately 40% carbohydrate / 30% protein / 30% fat at this intake level. I will stick to my usual 6 small meals per day with a post-workout recovery shake (or some other fast-acting carb with protein) on weightlifting days. Each meal will average 284 calories with 28 g carbohydrates, 21 g protein, and 9 g fat. I tend to feel rather congested, bloated and sluggish when I have too much dairy and sugar, so I will use limited amounts of these ingredients. STEP 2: Make a list of favorite foods. STEP 3: Make a list of healthy WHOLE foods that you actually like. STEP 4: Reinvent favorite foods using healthy substitutions or combine with other foods to meet macronutrient targets. The goal here is to have only one portion of protein, one portion of carbohydrate (not the usual 2-3 in Western meals), and one serving of fat in any meal. Pad Thai: Use noodles from package, but create new sauce recipe using Splenda instead of sugar. Add 1 c. veggies, 1/2 oz. crushed peanuts, and 3 oz. chicken breast, shrimp or lean beef per serving. Chicken fingers with Fries and Ketchup: Make coating using ground oats instead of flour and bake chicken breast fingers. Pair with baked sweet potato “fries” and low carb ketchup. Chicken or Shrimp Veggie Stir-Fry with Rice: Use olive oil spray for stir fry, sub Splenda for sugar in sauce, and sub brown rice or quinoa for white rice. Panera Asian Sesame Chicken Salad: Sub Newman’s Own Asian Sesame Ginger dressing or other under 40 calorie/2 T. dressing. Combine 3-4 oz. pre-grilled chicken breast with 4 c. mixed greens, 1/2 oz. almonds, and 1 sliced fruit or 3/4 c. grapes. Sushi and Sashimi: Make at home subbing Splenda for sugar in sushi rice vinegar mix. Pair with 3/4 c. serving of vegetables or salad and 2 oz. protein. Spaghetti with meat marinara sauce: Use WW or low carb pasta; 2-3 oz. limit. Include 2-3 oz. chicken breast, shrimp, or lean ground beef or turkey breast in the sauce and 3/4 c. of wilted cooked spinach. Cereal with soy milk: GoLean, GoLean Crunch, or Cheerios (oat-based) cereal only. Follow recommended serving size and combine with 1/2 c. light soy milk. Add protein source such as egg whites on the side. Taiwanese beef jerky: Use as protein snack serving. Add baked sweetpotato fries or fruit serving. Breyer’s Mint Chocolate Chip Ice Cream: Make popsicles with Dymatize Elite whey. Add mini choco chips. Trail mix with nuts and dried fruit: Make own trail mix with 1/2 oz. nuts, dried fruit, etc. for a total of no more than 200 calories. Steel-cut oatmeal and fruit: Use as carb serving. Pre-cook steel-cut oats for convenience. Chips: Use as carb serving. Make chips from sweetpotato using mandoline or food processor, add creole seasoning, and bake. Chinese dumplings/potstickers: Storebought; follow recommended serving size and serve with extra cup of vegetables or in a soup (wonton or egg drop). Chili: Use lean ground meat and add a LOT of extra vegetables. Serve over salad instead of rice. BBQ beef, pork, or chicken: Modify BBQ sauce recipes to use Splenda or fruit instead of sugar. Serve with quinoa, brown rice, or SP baked fries and 1 c. vegetables. Hamburgers with fries: Make burgers out of lean turkey or ground beef; wrap in lettuce leaves instead of using bun and add sweetpotato fries or fresh fruit. Use low carb ketchup. Crepes: Sub Splenda for sugar and ground oats for flour. Use 3-4 egg whites in recipe for protein. Sprinkle with sugar and add 1/2 serving of fruit. STEP FIVE: Develop meal plan based on list of favorite meals. I’ll be posting recipes for each of the above dishes over the next week. Today I am more or less following Menu 1. I have a small, semi-blasphemous announcement to make. I legitimately bought and paid for Precision Nutrition (version 1.0) last year, but I have no plans to pick up the recently announced, limited availability “upgrade” to version 2.0. Like many other fitness and nutrition geeks blogging and posting away on the forums and boards of the Internet fitness subculture, I was curious about Precision Nutrition, the nutrition plan to end all nutrition plans, and impressed enough with its author Dr. John Berardi’s articles on his website to justify the $97 price tag for the program. I’ve certainly paid more in the past for college classes, a not-so-hot hair cut and highlight session at a local salon, a single night at a hotel, and yes, nutrition and exercise coaching and plans from other experts. However, I fully realize that spending almost $100 on a nutrition program is a budget-breaker for a lot of folks out there, though, which is why I decided to write this article. I do not regret picking up the program because I feel that all education is valuable and I simply choose to funnel the money most women spend on cosmetics and clothing into acquiring more knowledge, but I absolutely do not feel that a bulked up individualization guide, some 90% compliance tracking charts, and the addition of actual calorie calculations/estimates (the original PN is rather patchy on how much you are supposed to eat for maintenance, fat loss, and muscle gain) are worth an additional $39.99 on top of what I’ve already paid, especially since I have already created my own free downloadable Excel spreadsheet to figure those things out and plenty of (also free) sites on the web also allow you to plug in your typical activities and workouts to pop out a ballpark estimate of your daily energy expenditure. To put it bluntly, I think the “upgrades” should have been made available to existing owners of 1.0 as free PDF downloads, particularly since folks ordering the PN program now automatically get the v. 2.0 extra materials without an additional charge. But let’s get back to exactly why I don’t consider the upgrade a must. I feel that my genetics are pretty average, and as such I respond pretty well to just about ANY nutrition plan as long as it contains sufficient protein, veggies, fruits, unprocessed starches, and the right amount of calories. Nutrition for the general fitness enthusiast/hobbyist like me who works out for 45-60 minutes 6 days a week and does not train for a sport is, well, not even close to rocket science. Maybe it’s a byproduct of the modern Western touchy-feely “everyone is special” attitude, but I think people have a tendency to think that they are each custom-built, one-of-a-kind sports cars with a slew of special fuel intake needs when in fact, 99% of us are just run-of-the-mill Toyota Camrys that run perfectly well on the cheapest unleaded gasoline and regular oil changes every 3 months. I love the Gourmet Nutrition cookbook and would definitely recommend getting the PDF download of it (no shipping there, at least. 😀 ). Besides the recipes, there are also quite a few good tips on how to speed up food preparation. As for the rest of the system…one of the members of a women’s fitness forum I run asked about PN a while back and I compiled a list of links to Dr. Berardi’s articles on his site that more or less cover the basics of PN as well as how to tailor it for yourself. Between those free articles, Dr. Mohr’s nutrition guidelines for TT (which are already VERY close to the nuts and bolts of PN), Gourmet Nutrition, and the two free PN PDF downloads that I also linked in my response–Gourmet Nutrition Desserts and Precision Nutrition Strategies–you can probably piece together the majority of the program on your own. If you are still hungry for more knowledge after reading those articles, then by all means pick up the full program, but I don’t consider it a necessity if you are already pretty well-read on sports/bodybuilding nutrition and don’t need someone to hold your hand through bulk food preparation. Pick up the PDF copy of the Gourmet Nutrition cookbook, and you’ve pretty much got the PN system for 1/3 the price, sans the audio CDs (which just reiterate the 7 habits and some cooking tips from Gourmet Nutrition) and the DVDs that explain things to true newbies. Unless you really, really want to have access to the forums at PrecisionNutrition.com to ask questions or access the bonus workouts, I don’t think the full program is required to design your own PN-based nutrition plan if you have a pretty good understanding of healthy nutrition already and are comfortable with preparing your own meals. Just use my (free!) Fat Loss Spreadsheet to calculate your caloric intake needs for both maintenance and fat loss, consistently and diligently apply the 7 habits, post-workout nutrition, and tailoring techniques covered in his articles above, pair the nutrition plan up with a good workout regimen that includes both resistance training and cardio/intervals (Body for Life, Turbulence Training, Leanness Lifestyle, etc.) and voila! You’re doing PN! And if you STILL can’t shake the hankering for the “real” Precision Nutrition v. 2.0 program after taking a swipe at it yourself using the wealth of free resources on Dr. Berardi’s site, I’m not going to try to talk you out of it. Just realize that after reading through the articles above, the official PN binder is a most definitely a want, not a need, and make your spending decision accordingly.